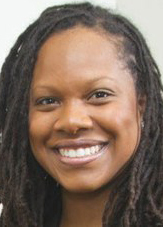 Timeka N. Tounsel is an Assistant Professor in African American Studies and Media Studies. Her fields of inquiry include Black (digital) popular culture, audience studies, womanism, and feminist media studies. Specifically, her research considers how Black women make sense of themselves in and through mass media. Her article on black women’s faith-based social media discourses is forthcoming in the Journal of Media and Religion. Her work can also be found in Interpreting Tyler Perry: Perspectives on Race, Class, Gender, and Sexuality and the Media Fields Journal. Tounsel’s book project, Tangled Visions: Black Women and Media in the Age of Obama, investigates the paradox of visibility that black women experienced from 2008-2016. Specifically, the book analyzes how black women media professionals and general audience members navigated a matrix of entanglements as they went about constructing themselves through television and digital media. Prior to earning her Ph.D. in Communication Studies, Tounsel worked in the magazine industry and has written for Essence and BLAC. She received her B.A. in Magazine Journalism and International Relations from Syracuse University.